Viera Lerus is an Imperial knight, and the captain of the Bravil City Watch. She will take part in the Defense of Bruma if you complete the Bravil part of Allies for Bruma; if she has died, you will not be able to complete the Bravil part of the quest. Viera has a very busy life as a captain of the guard. She sleeps in the Bravil Castle Barracks between midnight and 6am. She has two meals a day in the barracks: one at midday lasting two hours, and a second at 7pm lasting three. While on duty she has five potential areas to patrol. Every two hours she will choose one at random. Patrol 1: Guard the North Gate. Patrol 2: Patrol the south end of town. Patrol 3: Guard the Count's room in the North Wing of the Castle Private Quarters. Patrol 4: Protect the jailor in the town dungeons. Patrol 5: Stand guard in the Castle Great Hall. During her scant free time she will wander the barracks, although her schedule should always keep her quite busy. If you aid County Bravil during the Allies for Bruma quest, she will be sent to Bruma to help defend against potential Daedric attacks. She will set up her tent in the Castle Courtyard, and will sleep in it from midnight to 6am. The rest of the day she wanders the guard encampment, chatting with any fellow soldiers who are recruited. During the Defense of Bruma she will take part in the battle. Should she survive she will applaud the player when the Great Gate is closed, although a bug caused by her involvement in the quests will mean she can never return to her previous life in Bravil. As guard captain of Bravil, she's armed with a silver longsword, and wears the Bravil cuirass, along with chainmail greaves, chainmail boots and chainmail gauntlets. She carries a small amount of gold and keys to Castle Bravil interior and exterior. She has one leveled Illusion spell, which is either an Invisibility, Chameleon or Silence spell. When you approach her, she will politely introduce herself: "I'm Viera Lerus, captain of the Bravil Guard." When asked about Bravil, she is reserved, at least until you raise her disposition accordingly. She will then tell you about how hard it is to keep up working for such an irresponsible Count: "The Count used to be a great man, but power and idleness have spoilt him. However, we remain loyal in memory of past kindnesses, and to serve Bravil." 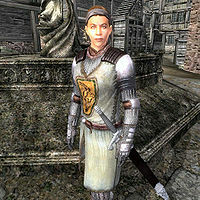 During Allies for Bruma, after you've completed the Bravil part of the quest, she will greet you with: "I look forward to fighting these daedra side by side with the Hero of Kvatch." If she survived the battle, she will then greet you with: "Hail, daedra-slayer!" Although Viera is captain of the Bravil City Watch, she is not a member of the Guard class. Therefore she is unable to arrest you if you commit any crimes (although her high responsibility ensures that she immediately reports any crimes she may witness). Should Viera survive the battle of Bruma, she may immediately return to Bruma after arriving at Bravil, as her schedule still has her sleep in her (now missing) tent there. Because of this, she will forever travel back and forth between Bravil and Bruma until she gets killed.